Eddie Odell Pinuel, 75 years young, departed his earthly life on January 29th, 2018 after a courageous battle with cancer. He was born December 12, 1942 and lived all over the United States. 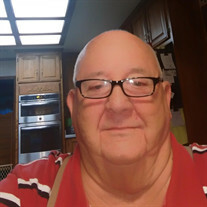 He graduated at Heidelberg, Germany High School and served 4 years in the United States Air Force, lastly working at Southwestern Bell for 42 years. Retirement was spent on his beloved golf course with all his golf buddies, but nothing brought him greater joy than his family. He is survived by the love of his life, wife, Gloria Jean Pinuel ; daughters, Elizabeth Tatum and Eddie Jean Pinuel; granddaughters, Miranda (Donte) Pullie and Ashlii Partin (Jose) de Yanez; great-granddaughters, Nevaeh, Lilliana, and Faith, which he affectionately called "his girls"; father, Bobby Leo Preston; sister Bobbie Louetta (David) Craddock; a host of nieces, nephews, and friends. He is preceded in death by mother, Margaret Stacks Preston and grandmother, Elizabeth Jane Stacks. Visitation will be Monday, February 5th from 6-8 p.m. at Smith-Sherwood Funeral Home, 7700 Hwy 107 Sherwood, Arkansas. Graveside Service will be 11:00 AM Wednesday at the Arkansas State Veterans Cemetery in North Little Rock.